Intel said Wednesday that is has joined the board of directors of the Alliance for Wireless Power (A4WP), a consortium developing technology for wirelessly charging electronic devices. 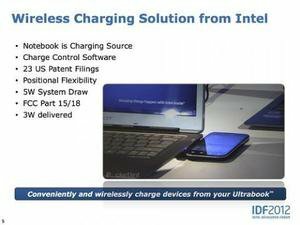 However, Intel said last year that Ultrabooks capable of wireless charging would arrive in 2013—a promise the company has yet to make good on. Virtually all of the major chipmakers have now joined A4WP, a spokesman for the group said, including Broadcom, Qualcomm, and Samsung, among others. A4WP uses near-field magnetic resonance technology to charge a nearby device, like a cell phone, if both the power source and the target device support the technology. At its Intel Developer Forum last year, the company said that it would add wireless charging capabilities to its Ultrabook platform sometime this year. Intel’s Wendy Boswell said that Intel would favor a so-called a “BE BY” implementation of wireless charging, where a phone or mobile device would merely need to “be by” the source of the wireless power—in this case, the Ultrabook. In a blog post, Boswell wrote that the company was working with Integrated Device Technology to develop the transmitters and receivers, which would consume 5 watts at the transmitter end and broadcast the equivalent of 3 watts of power at the receiver end; 2 of those watts would be lost in transit. Qualcomm has proposed a similar “be by” solution—the Qualcomm Halo—for charging electric cars. By contrast, inductive charging pads from Energizer, Qi, and so on have been available since 2010, with inductive solutions designed for everything from the iPad to electric cars. Those are characterized as “BE ON” solutions because they require physical contact. Unfortunately, Intel has yet to deliver on its wireless charging promise. “Eventually, the technology is aiming toward an Ultrabook coming pre-built with WCT detection software, enabling users to merely place their smartphones or tablets in the vicinity of their Ultrabooks and charge away,” Boswell wrote. “Intel is definitely putting its money on wireless charging, and plans to build the technology into Ultrabooks by 2013, implementing transmitters into these machines with receivers built within a range of devices using Intel’s own chips,” Boswell added. An Intel spokeswoman did not respond to a request for comment by press time. So far, however, Intel has yet to add the wireless charging technology to its own recently launched “Haswell” platform, which leaves the add-on solution that Intel previouly proposed. IDT said last year that it planned to sample the IDTP9030 transmitter in the first half of 2013, which would leave volume production for the second half of the year. Graham Robertson, vice president of corporate marketing for IDT, said that while its magnetic induction (BE ON) chips were in full production, magnetic resonance chips are in full design and sampling with Intel, slated for full production by early 2014. But Intel’s announcement is “good news for the ecosystem,” he said in an interview. With the delays, it appears we won’t be getting Ultrabooks with wireless charging this year after all. Still, delays of this type aren’t that unusual, and—assuming IDT can find OEMs and smartphone or tablet makers to build in its technology—the days of trying to track down a USB cable to charge your phone may be numbered.